In the darkness of uncharted space aboard the crippled colony vessel "USCSS Theseus" there is nowhere to hide, nowhere to run, and in space, no one can hear you scream! "The Hunt Begins" is a fast-paced, claustrophobic, "express elevator to hell" miniature game of combat between three of the most dangerous races in the galaxy. Join the ranks of the brave men and women of the US Colonial Marines and arm yourself with state-of-the-art weaponry or take command of the elite cadre of Predators, an alien race of hunters that seek the finest prey to stalk, hunt, and eliminate. The darkness holds more horrors than these two adversaries... The Xenomorphs, one of the deadliest of all known alien species with the potential to destroy and eradicate all sentient life. "The Hunt Begins! offers two challenging game modes, which can be played by one or more players. The first of which is Competitive: All races battle against one another in mission and objective based combat. 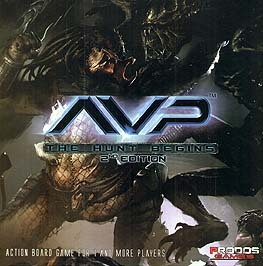 The second is Cooperative: A fragile alliance has been drawn between the Marines and the Predators, neither of which can survive alone against the alien threat.